We’ve all been victims of ‘punching above our weight’ and trying to chat up people who are out of our league but most of us know when to take rejection – not Georgie Porgie. Nope, instead the school nerd persists in chasing down the most beautiful girls and sinking his lips on them to make them cry – but it’s you who will have the last laugh with a free spins mode which rewards you with more spins the fresher your breath is! 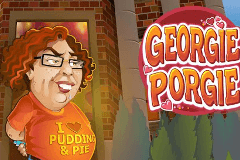 The Georgie Porgie slot machine is one of Microgaming’s Rhyming Reels slots based on nursery rhymes with other titles in the series including the Jack & Jill slot machine and the Old King Cole slot machine which I’m sure you remember being recited to you as a child. Despite its English roots, the Microgaming version of the nursery rhyme takes place at an American college campus where Georgie bypasses security and kisses distracted girls who are eating pudding and makes them cry only to escape running for his life when the college jocks make an appearance as he knows if they catch him they’ll beat him to a pulp or stick his head down the toilet. How Much Will a Kiss Cost? This nursery rhyme themed slot is played across a 5x3 set of reels with 15 paylines and it has been designed to play out in pages of an open book in true literature style. A friendly RTP is boasted of 95.97% and the betting options are just as generous as you can stake from 1p up to £10 per line, therefore you can play with all paylines active from 15p up to £150 each spin. Microgaming have recreated the nursery rhyme across the reels perfectly with dramatic scenes as Georgie leaps into action and kisses the prettiest girls on campus. The Georgie Porgie logo is the Wild symbol with the ability to substitute for all other symbols except the Scatter which is a fresh mint breath spray that burst with flavour when part of winning combinations. The nerdy and unlucky-in-love Georgie Porgie (with greasy ginger hair, oversized glasses and buck teeth) graces us with his presence in a bright orange shirt with ‘I love Pudding’ printed on it plus there are chronological illustrations retelling the nursery rhyme as he kisses a girl with another symbol showing her cry her eyes out top her friend, the college jocks coming to her rescue, and Georgie running away as fast as his little legs will carry him – plus there are also Ace to 10 playing card symbols that are unrelated to the story. Before kissing girls it’s always best to make sure your breath smells good first so it’s best to carry around some fresh mint breath spray just in case you get lucky – and the better it smells the better as it results in more free spins being awarded as follows. While that’s a hefty number of free spins it’s the massive 5x multiplier that all wins are subject to which I’m sure will shock you most, and for every breath spray symbol that lands during your free spins you are awarded with an additional free spin, while landing two on the reels is worth 2x your stake. Georgie is always kissing girls out of his league but each and every time you land a winning combination you’ll be tested as to how lucky you are feeling. This gamble feature offers you the opportunity to double or quadruple your winnings – but choose incorrectly and they vanish just like Georgie’s chance of pulling a beauty. To double up you’ll simply choose if the playing card will be red or black while to quadruple you’ll need to identify they suit of the card (heart, diamond, spade or club) and if you’re as geeky as Georgie and believe in spotting trends you’ll be pleased to hear that the previous seven results are displayed. Will Your Luck Be In? The Georgie Porgie nursey rhyme is a classic and this is certainly a welcome addition to the Rhyming Reels series of games developed by Microgaming. Uplifting music plays as you spin the reels and the story is retold perfectly with dramatic symbols that offer big payouts, but it’s all about the sensational free spins mode where it certainly pays to have fresh breath!